Remember Equifax? Deloitte? Sony? Apart from being all huge companies dealing with very sensitive customer data, they all got hacked, and the fallout was bad. Scrutiny into their security and data management was inevitable and the results would have been a whole lot different, perhaps even avoided, had they modernized their security systems. In the world of big data and digital transaction, customers want to know their information can be trusted; that it can be stored and managed safely and effectively is a fundamental concern to the development of this trust between customers and businesses. There exist very similar traits in consumer trust that extend into the digital age; protection of assets and sensitive information, the defense against malicious attacks, and the confidence to use services that ensure these protocols are being met. Amongst other things, when we achieve these conditions, we can ensure that businesses promise the utmost security in consumer transactional-based business. Enter blockchain technologies, perhaps the most ground-breaking technological development in the last decade; a peer to peer encrypted security network where information is not stored in one database at the mercy of a company with potentially under-developed security systems. It’s being studied and adopted by all the biggest business verticals. That should be news enough to know its absolute importance in contemporary trade. Introducing the Token Security Scheme. ‘Multiple’ and ‘trusted’ are common keywords for the Scheme. Multiple verifications for signatures, trusted verifications, and qualified experts ensure up-to-date compliance with security measures. It is a professional amalgamation of high-security services all under one scheme, providing a secure package of the latest and greatest safe-measures to ensure consumer crypto’s flow safely from one place to another. The safekeeping of digital assets is a high priority to ensure effective and trustworthy digital trade. The Token Security Scheme will develop and host crypto wallets, crypto exchanges, provide safe identity repositories and much more. They do have one fundamental aim: to minimize the theft of crypto-assets from both the individual and the business, as well as providing a safer landscape to carry out all crypto-activities. The Token Security Scheme will host an ICO of its’ native TSS token, ending on December 4th. This allows participants to purchase a maximum of 100,000,000 TSS tokens to support and bring the security platform project to fruition. The only currency accepted when purchasing tokens is Ethereum and there are exclusive bonuses available depending on the phase contributed. Interested backers should refer to the website for more information. Visit the Website for more Information: https://www.tsstoken.com. 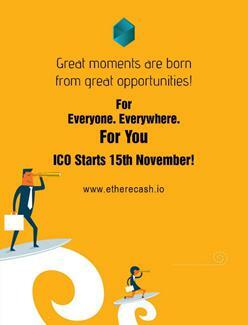 Following a successful pre-ICO, Etherecash has announced a public ICO that launched November 15th and will end December 19th. Focusing on the 2.5 billion unbanked, Etherecash looks to excel in both spending and sending, as well as providing a peer-to-peer lending platform, to enable those with little or no credit history the ability to access funds. The lending industry has seen a boon since the economic crisis of 2008, but much of the new business has moved into the online world. The availability of credit in the traditional market for individuals and SMEs is not what it was pre-2008, thus creating demand for internet and mobile solutions like The Lending Club, which was responsible for over $55 billion in new loans during 2017. Morgan Stanley estimates that, globally, P2P lending could approach nearly half a trillion dollars by 2020. Implementation of blockchain technology will allow more people around the world to access funds when they need it, and the use of smart contracts will ensure that repayment is enforced. A user’s crypto portfolio will determine how much one can request to loan, as it serves as collateral. Furthermore, blockchain technology will help reduce the amount of economic crime that currently occurs within the banking sector, which is due to the massive problem of trust within the financial sector. For example, 57% of internal frauds are carried out by senior and middle management, according to the whitepaper. Problems such as asset misappropriation, cybercrime, money laundering, accounting fraud, and bribery make it difficult to ensure capital invested is used properly. The ICO sale will auction off 144,000,000 tokens, which will help support ongoing development of the platform and can be purchased with Bitcoin or Ethereum. A bonus of 12% is available for participants in the first week, which goes to 3% in week four, and finally to 0% in week five. The ICO has a soft cap of $15 million, which if not reached, will conclude the ICO as a failure with funds returned to the respective investors. The hard cap is set at $100 million. 40% of funds will be used for further core development; 25% in growth and marketing; 20% for legal, accounting, and advisory feeds; and the remaining 15% for admin and operational costs. Q1 of 2018 will see further expansion of the team as well as strategic consultants to further refine the plan of execution to achieve milestones. The second quarter of 2018 will see the developing of the platform. Decentralized marketplaces are picking up steam these days. There are a variety of new companies launching different concepts of decentralized marketplaces. There is Soma, for example, a social marketplace. Now, a new startup is launching the concept of a marketplace just for niche products and innovative electronic products. The new startup is curiously named Hamster, and it has an ICO slated for Q4 2018. The first thing we see in the Hamster whitepaper is that they are making it a non-profit marketplace. Non-profit entities are generally received with skepticism in the ICO world: how would the value of their coins increase and sustain themselves in the future? How will the investment of the token holders be worth it? As you read further down the Hamster’s whitepaper, they believe that they can square things out by the “mechanics of the platform, and by the guarantee of the eventual buy-back of HMTs using funds from the ultimate sale of the marketplace.” Their token is called the HMT Token, and the general idea is to eliminate the presence of middle-men in niche-based marketplaces that often charge more for one-of-a-kind products that you need to purchase. The tokens are based on the Ethereum ERC-20 token. The idea behind the removal of third-party involvement is that sale-and-purchase is pretty generic, yet effective. Decentralized marketplaces will eliminate the need of these third-party actors, thus getting rid of their server fees, employees, and need for their infrastructure. A dedicated, decentralized workforce will work on the platforms like Hamster and will be rewarded for their actions. This will shift the paradigm of marketplaces from conglomerates and behemoths like Ali Baba and Amazon and enable freer trading and put power back in the hands of small and medium enterprises like a free market economy should. The Hamster marketplace is especially for the innovators and people who appreciate innovative products and want to buy them. The problem with innovative products is that they are often one-time and there are plenty of logistical issues associated with their running. The regular companies like eBay and Amazon make it very difficult for these niche products to exist in a sea of their commercial products at low prices. It is certainly not viable enough for them to go after such a small group of users who probably will have more issues and have the potential to generate only a meager revenue. Since Hamster is decentralized and brings the focus back to originality and each unique user, it is definitely a platform to look forward to, regardless if you invest in it or not. The idea for Hamster came from Russian electronics producer and now CEO Denis Bulavin. You might have seen the unique electronics that Russians are capable of making for entertainment and even everyday application. But, they are just not able to commercialize their ingenuity because of the lack of attention from big corporate marketplaces. Bulavin thought around the same lines and came up with an entirely new concept of marketplace just for niche products. The blockchain is at the center of Hamster’s developmental efforts. Hamster’s ICO will soon be announced by the company. Around 14 million HMT tokens will be available, and the company aims to raise around $28 million — a price of $2 per HMT token. Discounts are available in the upcoming pre-sale, though the date for it has not been announced. Participants can swap their ETH for HMT at the mutual exchange rate in USD. Upon completion of the ICO, early investors will gain access to testing of the new platform, as well as future discounts on products. The date for the pre-ICO and ICO will be announced by the end of November. The Moscow based blockchain poker room’s presale has already come to a successful conclusion, raising USD 400,000, with the main token sale beginning October 26th, 2017. The platform’s CASH tokens, offered during the crowdsale campaign will allow participants to earn a portion of the profits generated by the platform as it becomes operational. To avail this opportunity, potential investors who missed the presale can purchase Cash Poker Pro’s tokens early on during the upcoming main ICO round. The platform will offer the tokens against BTC, ETH, Waves as well as fiat (USD, RUR, EUR) currency payments. Cash Poker Pro is utilizing the funds raised during the ICO to market and promote the upcoming main token sale involving 50 million CASH tokens worth $0.50 each (10 times the presale price). The platform has early bird bonuses set for the crowdsale, offering another opportunity for the participants to get CASH tokens at a discounted rate. Funds from the main round will be allocated heavily into development and marketing, with the hopes of bringing players, both every day and poker stars from all over the world on to the platform. While the electronic poker room will serve primarily to the Russian and Kazakhstan markets, users globally will be able to access Cash Poker Pro’s services if they desire to. Cash Poker Pro looks to be a provably fair room, with an RNG that can be verified via the blockchain, and that allows users to play quickly and anonymously. The numbers will be generated by a set of Ethereum contracts, using a combination of input data from several sources for a better entropic set. The platform’s whitepaper discusses the random number generator in detail. The team behind Cash Poker Pro has over a decade of experience in offline gambling market as well as over three years of expertise in the poker industry. The poker room, when launched, will have electronic poker tables, bingo, lottery, as well as the necessary infrastructure to keep things running smoothly, such as casino security and risk management systems. The revolutionary cryptocurrency payments platform UTRUST has attained yet another milestone after it had very successful token pre-sale. The first stage of the crowdsale that went live on August 28, 2017, managed to raise over $1.5 million in under 90 minutes. UTRUST is the first ever cryptocurrency payments platform to incorporate consumer protections. With these new features, the platform is on the verge of positioning itself as the “PayPal” of digital currency ecosystem. Following the successful presale, UTRUST will soon be launching a public ICO, slated to begin on September 20, 2017. The brainchild of a team of experts in various domains including corporate management, B2C startups, payments, blockchain development, law, finance and more, UTRUST has gained a lot of attention. The crowdsale witnessed 1100 backers with over 3000 registered individuals waiting to lay their hands upon the tokens. According to the platform, a majority of the $1.5 million was collected during the first 30 minutes of the sale going live. The unexpected surge in demand for UTRUST tokens led to a significant slowdown of infrastructure, affecting the crowdsale, if not for the disruption, the token sale would have ended in under an hour. With the initial tranche of funds raised during the Pre-ICO, the platform will be proceeding with the technical development, strategic partnerships and to further the marketing initiatives. The round 1 of public ICO is set to start at 2 PM GMT on September 20, 2017, with a maximum cap of $4 million. It will be first of the seven rounds scheduled over a period to raise a total of $50 million. The ERC20 compatible UTRUST token is created over the Ethereum blockchain, and it is used for transactions on the payment gateway. These transactions don’t carry any transaction fees. In addition to free transactions over the platform, token holders will soon be able to trade them against other cryptocurrencies over supported trading platforms. The platform will be allocating a portion of the revenues to buy back the tokens from circulation, thereby increasing its value over time. Those who missed the UTRUST Pre-ICO can take part in the upcoming public ICO to purchase the platform’s tokens. Gibraltar-based green energy exchange platform WePower is now accepting fundraising registrations as the company gears up for its upcoming launch. The WePower pre-launch fundraiser is similar to a crowdfunding campaign, offering contributors the first chance to receive WePower tokens, in return for Ethereum contributions. A percentage of the clean energy produced and traded over the WePower platform will be allocated to energy tokens and stored in a smart contract. The WPR digital currency will be tokenized energy stored in a smart contract and accrued with the growth of WePower platform. WePower has already secured all partner agreements that would facilitate the launch, and all necessary Letters-of-Intent are in place. The Beta version is already live, and another major blockchain update is on the way, which will enable green energy investors to enter the market directly. By purchasing green energy, the platform, investors will finance the development of green energy producers and improve the market in the process. For some time, most leading scientists have strongly supported the belief that CO2 emissions, brought about through manmade climate change are having a detrimental effect on the world’s climate. These emissions, driven largely by the fossil fuel industry and deforestation, are poised to exacerbate the rise of global temperatures to an unsustainable level by the end of this century. One of the primary solutions to combat this serious problem is through a massive global investment in renewable forms of energy. WePower is focused on developing a distributed clean energy network based on blockchain and smart contract technologies. It intends to accelerate the shift from a centralized fossil fuel system to a more localized, decentralized clean energy system. The WePower platform connects existing and new renewable energy producers with companies and people willing to switch to clean energy and invest in a 100% renewable future. Through careful implementation of blockchain technology and smart contracts, WePower is helping solve multiple problems of energy sector at the same time. The platform also brings transparency to the amount of green energy produced, consumed, and how much CO2 emission was reduced in the process. In addition, energy developers cut intermediary commission fees or raise less expensive funds for new start-ups by selling future energy current prices. As a result, energy consumers benefit from the cheaper future energy and participation in CO2 or other green energy certificate markets. WePower can leverage experience from energy, law, the blockchain, payment systems, security and emerging digital finance industries to develop its platform. In doing so, it will begin to change the way how everyone can earn money by producing, buying and investing in green energy. The WePower pre-launch fundraiser is structured as a reward-based crowdfunding campaign, where contributors will receive WePower tokens in return for their Ethereum contributions. Part of the green energy that will be produced and traded on the WePower platform will be assigned to Energy tokens and stored in a smart contract. Thus, the WPR token will be tokenized energy stored in a smart contract and which accrues donated energy (i.e. projected green energy production) in the form of energy tokens. WPR token holders can use this energy for their own purposes or trade it on WePower platform at any time. It ensures liquidity option for contributors, especially if contributors are from places where WePower is not connected to the grid yet. Norwegian based tech start-up CybCSec Solutions has announced its new cryptocurrency — CybCSec Coin [XCS] as the company sets out to provide personal cybersecurity solutions for global businesses and individual users across the globe. The company has developed its business model in three individual stages. The CybCSec team is comprised of industry-leading developers from the cybersecurity sector, many with multiple years’ experience. The company’s mission is to become the leading developer in the Crypto-verse, by designing and implementing innovative security for both personal and business users. The CybCSec whitepaper offers a brief roadmap of the company’s three phase plan. The company has been specifically designed to offer a long term, stable ecosystem and a growth model that can easily be applied to already established businesses. The CybCSec coin cryptocurrency is currently undergoing the final stage of its testing before it is approved for full release. CybCSec coin wallets are already available for Windows, Mac, Linux, and Android devices. TOR network connections for secure messaging and Stealth addresses for anonymous receipt of payments have been already implemented and are in full working order. The platform already has agreements in place with a global sales team network operating in more than one hundred countries. The network includes over 10,000 different businesses, including restaurants, cafes, and shop, all which plans to soon accept XCS as a payment method. CybCSec Solutions expects to release a compiled database of retail outlets accepting XCS by the end of Q3 2017. Phase two feature release will see the application of user-friendly Smart Contracts, enabling everyday users to implement XCS into their established businesses. CybCSec Solutions plans to focus on a selection of different real-world and online retail merchants, working with their global sales team, to offer further aid to the currency, across the globe. The third phase of feature releases will introduce Antivirus, Cyber Security, Intrusion Sensors, Secure File Transfers and additional security based innovations being developed by CybCSec Solutions. Unlike other similar start-ups which have chosen to try and raise as much money as possible from their ICOs, CybCSec Solutions plans to sell just 2.5% of the total supply of available XCS tokens, to raise sufficient funds for Phase Two and Three development. The company will decide at a later date if it will need to sell additional XCS, for further development. The CybCSec public sale will have a similar structure to that of a typical ICO-style crowdsale, with different stages and diminishing bonuses as the sale gets closer to its fruition. The ICO will be hosted directly by CybCSec Solutions via its dedicated website, with payment processing being handled by CoinPayments. Unique Solar energy trading platform, SunContract has declared a total of over 8220 ETH (about $1.63 million) raised from its ongoing ICO, with still less than a week remaining. SunContract is a renewable energy marketplace developed by power specialists and IT professionals. The platform balances its service to incorporate market demands and blockchain technologies within the energy distribution industry. The SunContract Energy Pool is a P2P marketplace that facilitates the exchange of clean energy directly between customers without the involvement of intermediaries, through an automatic digital bidding process made possible through Ethereum smart contracts. The meteoric rise in the cost of traditional energy is exacerbated largely by sizable investments in infrastructure and costs relating to transmission, taxes, and losses through inefficient work practices. This trend and a growing availability of renewables have resulted in an increased development of the clean energy sector, which has led to a significant increase in the production efficiency. Also, there is often considerable excess energy, produced from non-conventional power generation units, which is controlled by small and large private individuals or companies. SunContract aims to reappropriate this excess energy by enabling the producers to sell it through the company’s open P2P market to all different types of consumers, without an intermediary or a trusted third party. The use of blockchain technology in energy market not only helps automate most of the processes but also acts as an energy fraud and theft prevention mechanism. The transparency, immutability, and security of the Ethereum blockchain makes it easier to track energy distribution and usage, as well as prevent meter tampering, power theft, and other fraudulent activities. SunContract focuses on the efficient use of clean energy, in a bid to reduce the company’s carbon footprint as much as possible. The company manages this by guaranteeing that all excess clean energy is stored correctly and eventually utilized properly. The company’s project started in 2016 but had already planned out its entire roadmap, explained in the whitepaper. SunContract’s ICO has been successful so far and will continue for few more days. Investors can participate in the initiative by purchasing SNC tokens with Ethereum on the company’s ICO page. SunContract’s native SNC tokens act as the main unit of exchange on the platform. Investors will receive 10,000 SNC tokens per every ETH, and with the recent increase in energy-backed tokens, the value of SNC is likely to rise when it hits the markets. The SunContract ICO has already surpassed the first milestone of 5000 ETH and now looks to hit 10,000 ETH. Interested individuals can participate in the ICO via the website. Following their successful website launch in 2014, mBit Casino has enjoyed a steady growth in user-base, as it became one of the most popular online Bitcoin casinos around. mBit casino has experienced this success due to its 24/7 live support, large monthly tournaments (for both slots and table games) and a generous VIP Program. More recently mBit Casino has been running a monthly tournament in which players have started to pay out substantial prizes. Every month at least 15 BTC in combined tournament prizes is paid out between 40 different players. In addition, players are also able to exchange their VIP comp points into Bitcoin and free spins. In total, mBit has been paying out over 20 BTC in monthly prizes, which is valued at around $50,000 today. On top of this payout mBit casino also pays out additional everyday bonuses, welcome bonuses, and weekly cash back offers. mBit also casino runs two monthly tournaments, the 10 BTC Slots Tournament and the 5 BTC Table Games Tournament. The Table Games Tournament pays out 5 BTC in prizes to the top 10 Table Game players and the Slots Tournament rewards the top 30 slots players each month with a total prize pool of 10 BTC. Players can collect points across the month, based on the total amount of Bitcoin they bet in the corresponding games. Players have the whole month, every month, to earn as many points as they can on the leaderboard, after which prizes will be added to their account on the first day of the month.